Good guess, everyone! :D Yep, it's cheese. And it was marinated in something very Japanese. Rosa's answer was correct, except that the cheese was not smoked. I accidentally found a Japanese website talking about this interesting idea, and as usual, I couldn't resist the temptation to try it out myself. It didn't sound as strange as the combination of sweet bean paste and raw peach. I've read many times that fermented foods usually make good combinations. But I knew I had to be careful about the miso I use. When I marinated tofu in miso before, it turned out too salty. So this time I blended a little amount of regular miso and bunch of saikyo miso, added mirin and heated it to make marinating paste. 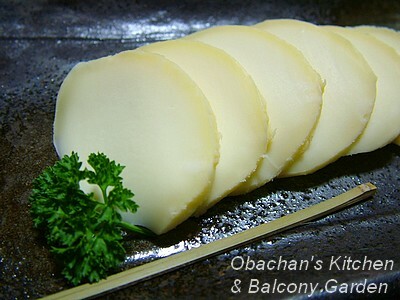 Japanese) harmony of salty miso and milky flavor of cheese. Adjusted the saltiness of the miso paste, this will be my favorite appetizer for sake. It's interesting. I don't think cheese is a great appetizer for sake as-is, but if added a little amount of very "Japanese" ingredients -- such as soy sauce, miso, bonito flakes or kelp -- it turns into a nice accompaniment for sake, our traditional liquor made from rice. It looks like provolone to me too, but I can't figure out how "Eastern" plays a part. I second the cheese kamaboko bit. Cheese amrinated in soy suce? Or... Sake?? my guess is mozzarella cheese soaked in sake. I know you can get sake over there but how about miso? If you could find miso over there, it mihgt be interesting to try marinating cheese that has light taste. I thought the miso brought out the milky flavor of the cheese. Thanks for the answer, Obachan! What a fantastic idea! I'm going to have to try that, so I'd like to know how long you marinated it for. I've been cream cheese with soy sauce and katsuobushi since I tried a sample at a cheese shop. It's amazing how well these East/West ingredients work together! You also mention kelp, and I was wondering how you'd blend that with cheese. I marinated it for 2 days, but I guess it was too long. The surface turned a little -- just slightly -- plastic-like, but the cheese didn’t get as much saltiness as I wanted. So I should have used more salty miso paste and marinate the cheese overnight or one day, maybe? Oh, and the mozzarella I used was Jusco’s Top Value brand. Next time I might try a different brand. As for cheese and kelp combination… Actually I haven’t tried it yet. I just read about it in manga. IIRC, it was diced cream cheese and boiled (?) and cut kelp mixed together, and a little soy sauce poured over??? or something... Sorry, I don’t remember exactly. I saw that in the manga,“Kuroudo蔵人”in ビッグコミックオリジナル a while back. Your husband might know this manga… :) Also, in the latest episode of the same manga, cream cheese marinated in sakekasu was introduced. If you get it right the colour around the edge is very beautiful. OMG, I never thought about using this for sushi!! How creative.